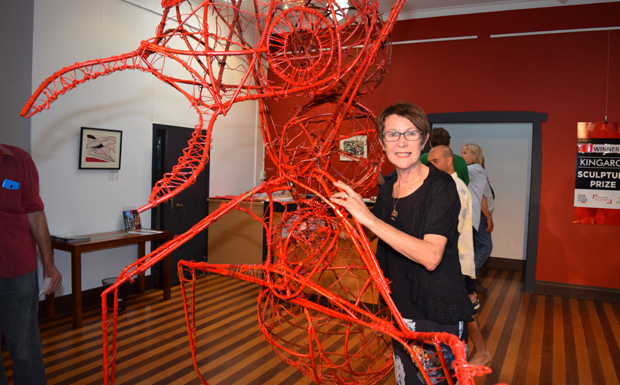 The sculpture was created by Brisbane artist Charlie Carrigan, who describes herself as a “creative expressionist”. The announcement was made on Saturday morning before a crowd of about 30 people at the Kingaroy Regional Art Gallery. The biennial competition, which began in 2017, offers a $7000 first prize open to sculptors from anywhere in Australia; a $2000 local prize for sculptors who live in the South Burnett; and a $1000 encouragement award. It was created by the gallery’s managers, the Kingaroy Arts Team, with the aim of acquiring pieces that could be displayed as public art in the region’s parks and outdoor spaces. The 2019 event attracted 11 entrants and judges Maureen Meggit-Lorne and Wayne Brown spent many hours last Tuesday selecting the winners. 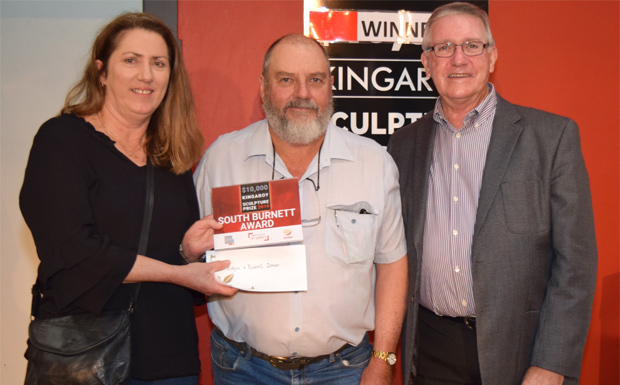 The awards were announced by South Burnett Mayor Keith Campbell, who officially opened the exhibition and congratulated the entrants on their efforts. The judges said they’d had a very difficult time selecting the winners. “The visual arts represent us, our humanity and our ability to create,” Wayne told the audience. 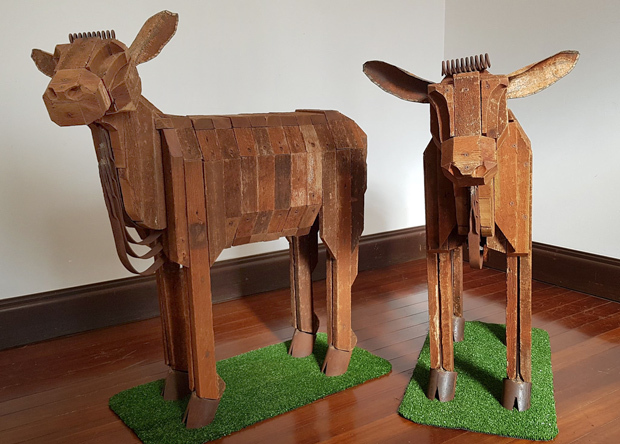 The $2000 South Burnett prize was awarded to Tingoora couple Russell and Robyn Dower for their sculpture of two cows, “The Weaners”. Robyn told the audience it was made out of 50-year-old fence palings sourced from their property. Her husband Russell played an active role in preparing the wood for the sculpture. 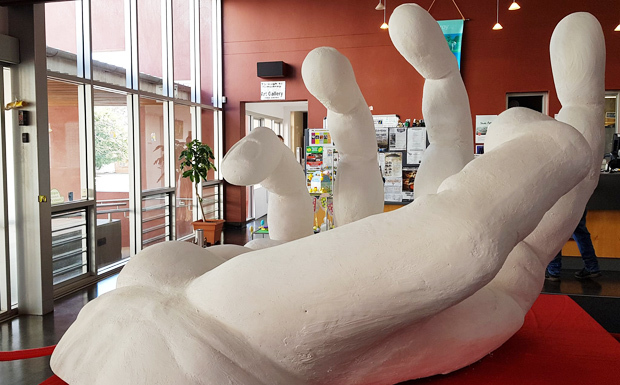 The $1000 encouragement award went to Mark Ladyman, from Wattle Camp, whose styrofoam sculpture of a giant hand was mounted in the adjoining Kingaroy Visitor Information Centre. 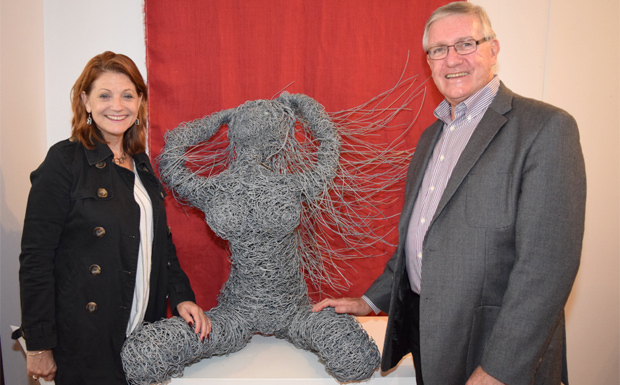 The day’s top prize of $7000 was awarded to Brisbane artist Charlie Carrigan for her metal sculpture “Evancee”. Charlie said she was both delighted and surprised to have her work chosen. She had only recently taken up sculpture after a break. Another work that drew a lot of attention on Saturday was a giant red ant sculpture created by Gold Coast artists Andrew Cullen and Dion Parker. The steel and wire creation, which towers ominously over the main gallery, drew the admiration of both the Mayor and his wife Marion. 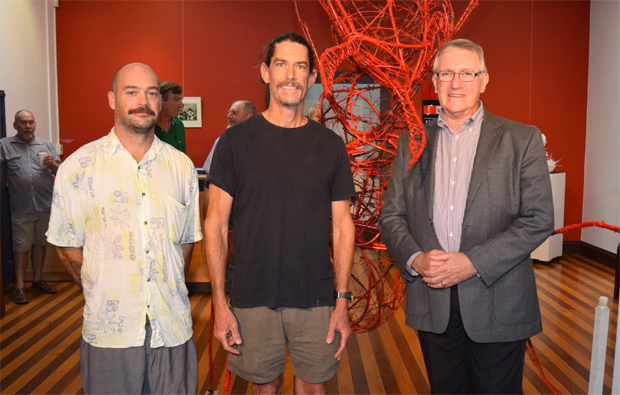 The Mayor speculated – perhaps jokingly – that the sculpture might be a great decoration for the Rogers Drive roundabout to welcome visitors to Kingaroy. All entries in the sculpture competition will remain on display at the Gallery from 10:00am to 4:00pm weekdays, and 9:00am to 1:00pm on weekends and public holidays – except for Good Friday and Anzac Day – until the end of May, when they will be replaced by the Gallery’s two-month Winter Craft Festival. Admission to view the exhibition is free.